In a move to make you sit comfortably with correct posture, Darley Butler & Company offers very lucrative discounts for world famous BackJoy posture corrector seats. BackJoy is a safe and effective way to relieve lower back pain and improve posture. It positions your body in correct posture for all-day sitting comfortably. When you are busy with your computer or driving, you naturally forget correct seating posture and slouch your spine to make a “C” shape which can cause back pain, knee pain and other complications. The healthy seating posture is what makes an ‘S’ shape in your spinal cord. The BackJoy is a heavily researched product, made from a strong, durable moulded resin, which feels like it will last very well over time. 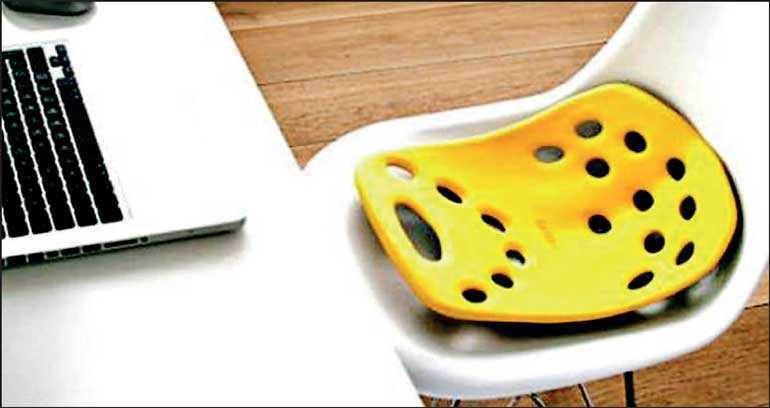 The base resin is covered with a soft, felt-like layer to provide comfort to the user. Using Back Joy is very simple. Place it on a chair or seat then sit on it. The carefully engineered shape means that you are naturally forced to sit in such a way that your pelvis aligns correctly and with that comes a relief of strain and tension in your upper and lower back. Because the BackJoy is not attached to your chair, it is dynamic and reacts to the way your body moves, allowing your spine to sit in proper alignment – which will reduce stress induced pain. Its three-part design tilts, cradles, and lifts your pelvis to attain better posture and a pain-free back. BackJoy comes in a number of colours to suit your preferences. Darley Butler & Company is the sole distributor for BackJoy in Sri Lanka. For further information contact Dilan 0112421311-4, fax 0112478776, mobile 0773290063.